The restoration of an historic Baltimore building proves a unique challenge for a local decorative-finishing company. 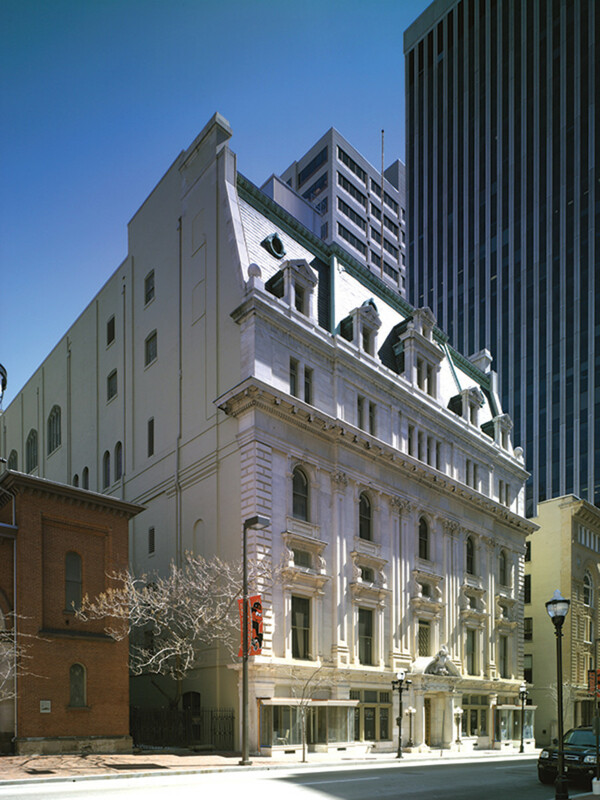 When the Grand Lodge of Maryland Masonic Temple was completed in 1869, it stood on Charles Street in downtown Baltimore as the center of Maryland’s Masonic activity. Architect Edmund G. Lind’s three-story structure would be reconstructed and enlarged twice – after fires in 1890 and 1908 – according to the designs of Joseph Sperry; an additional floor was added after the first fire and two additional floors and a Mansard roof were added after the second. Originally constructed in 1869, the Grand Lodge of Maryland Masonic Temple served as the state’s masonic headquarters until 1994. Now the Tremont Grand, the 90,000-sq.ft.building features 140 rooms spread out over seven floors. It remained the Mason’s headquarters until 1994, when it was purchased by the owner of the nearby Tremont Park and Tremont Grand hotels. With the recent completion of an ambitious restoration and adaptive reuse project, the seven-story, 90,000-sq.ft. Renaissance-Revival Masonic temple has been converted into the Tremont Grand Meeting Facility. 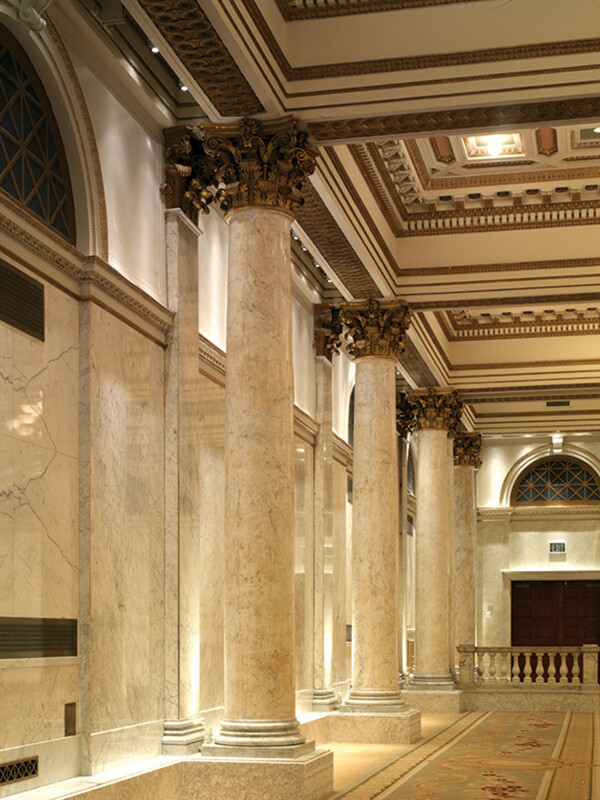 The restoration and adaptive reuse of the historic structure was orchestrated by Washington, DC-based developer William C. Smith & Co. and the Baltimore-based architecture firm Murphy and Dittenhafer, Inc. Owing to the work of Thomas Moore Studios (TMS), also of Baltimore, the interior of the Tremont Grand is now as opulent as its history is rich. 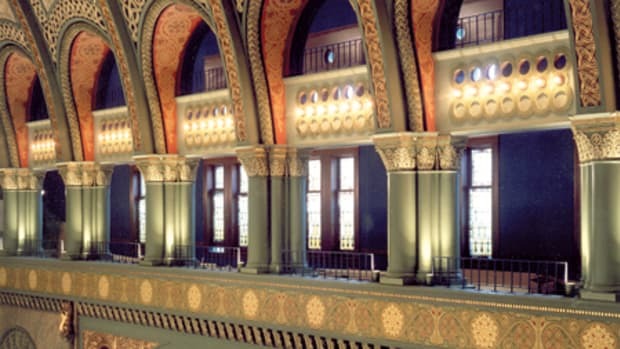 With names like the Corinthian Room, the Tuscan Room and the Oriental Room, the building’s 140 spaces – each with a specific architectural style necessitating a specific decorative-finishing scheme – exhibit the range of services that TMS provides. On the second floor, the 4,250-sq.ft. Corinthian Room is ringed with columns rising to a 21-ft. ceiling. In order to give the feeling of looking out on an outside courtyard, TMS painted trompe l’oeil Roman grilles – mimicking real grilles over the room’s entrances – in ten lunettes along the room’s long walls. 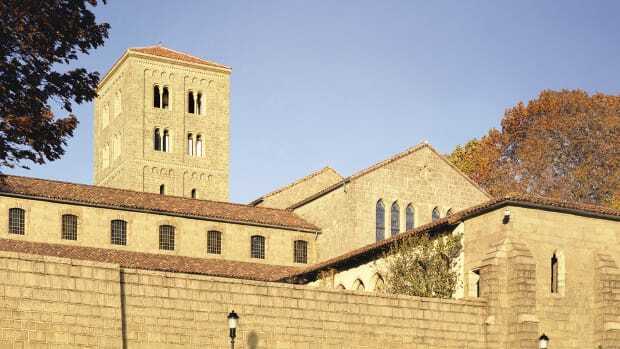 While there wasn’t a lot of heavy damage, most of the rooms were in a general state of disrepair when the project got underway in March of 2004. Charged with creating an elaborate banquet, meeting and conference space, TMS set out to preserve the historic, ornate aspects of the building while at the same time imbuing it with a fresh feel. 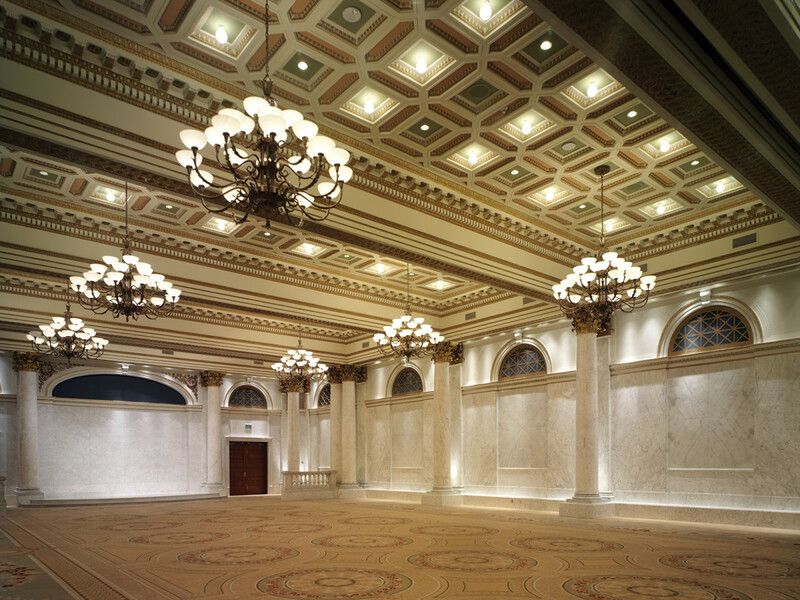 The ten main meeting rooms of the Tremont Grand are spread out over its lower five floors. The highlight of the second floor, and possibly the entire building, is the 4,250-sq.ft. Corinthian Room. Its open space, appropriate for large meetings, receptions and dinners, is surrounded by columns with gilded capitals rising to a 21-ft.-tall ceiling. Copying the pattern of existing Roman grilles – from the old heating system – in lunettes over the two entrances at either end of the room, TMS painted ten trompe l’oeil grilles in formerly blank lunettes along the long walls of the room, each grille backed with a dark azure color. “We tried to give the feeling of a grand pavilion,” says Thomas Moore, president of TMS. “With the grilles, we did a trompe l’oeil treatment to give the feeling of looking out through the grilles to an outside courtyard.” Two scenes, dawn and dusk, were also designed and created for two large lunettes at either end of the room. An enriching glaze was also applied to the column capitals throughout the room and the decorative ceiling was given a polychrome finish, highlighting its ornate plaster work. Other work included applying enriching glaze to the capitals and giving the decorative plaster ceiling a polychrome finish. Abutting the Corinthian Room is the 2,380-sq.ft. Roman Room. Here, the goal was to incorporate the palette from the existing Roman fresco paintings into the rest of the room, giving it a Classical feel. 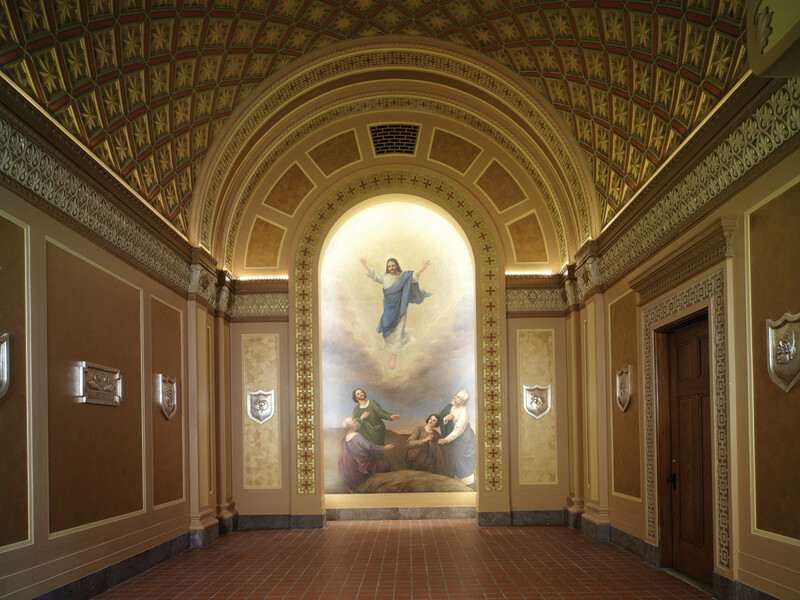 The historic murals were restored, the decorative plaster ceiling and caissons were given a polychrome finish and custom glazing was applied on the wall panels. 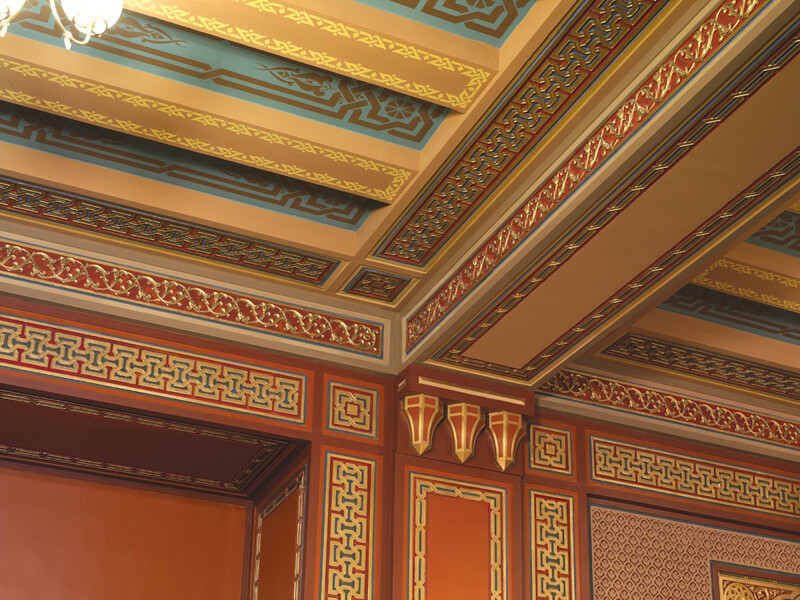 In the fourth floor Oriental Room, TMS restored the polychromatic marquetry walls, removed unstable distemper paint on the ceiling, replicated the original historic stenciling and applied it to the entire ceiling and restored the faux-leather dado. In all, 23,000 sq.ft. of multicolor, faux limestone glaze finish was applied throughout the building, with colors being adjusted fit each room. In the corridors, textured Venetian stucco was applied to replicate historic plaster walls. Given the varied architectural characteristics of the rooms, TMS had to decide early on whether it was more important to highlight their differences or to tie them together. “There was a desire to bring it into contemporary taste, but we wanted to keep the historic feeling of the architecture,” says Moore. “For example, you have the Ionic Room and the Tuscan Room. When we tried to tie them together, we found that it didn’t make sense color-wise, given the feminine quality of the Ionic Room and the masculine quality of the Tuscan Room. For a hospitality building, it just made sense – why would you want to rent one room as opposed to the other if they’re all the same? So we determined that to highlight the uniqueness of the building, we needed to understand the architectural framework of each room. In the 2,380-sq. 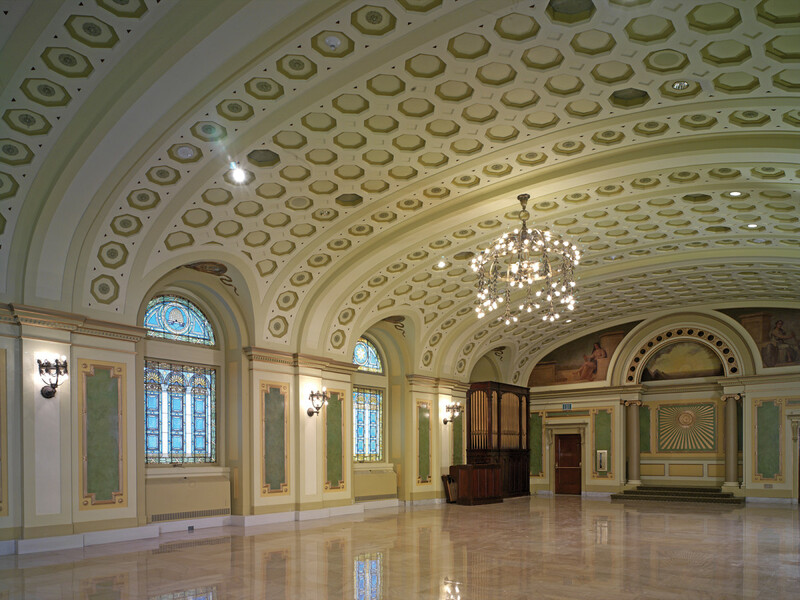 ft. Roman Room, the decorative plaster ceiling and caissons were given a polychrome finish, the historic murals were cleaned and restored and custom glazing was applied on wall panels. One unusual aspect of the project was the 100 years of accumulated residue buildup from incense, candles and coal dust. “It was absorbed into the walls as well,” says Rina Steinhauer, of TMS. 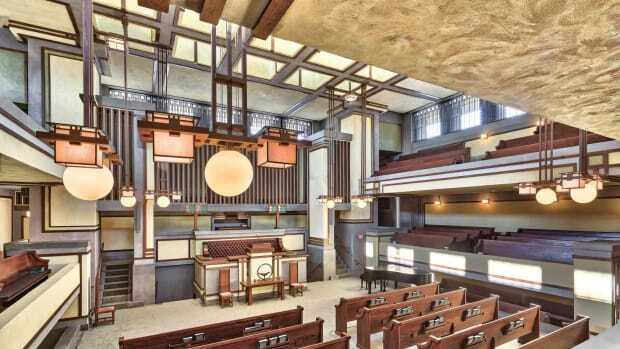 “This created a sort of a crisis, because a lot of the decorative painting work was going on while the HVAC system and the modern amenities were being put in, which is not the way that you typically want to work – you really want to have the new metabolism of the building established before you start doing the decorative finishes. 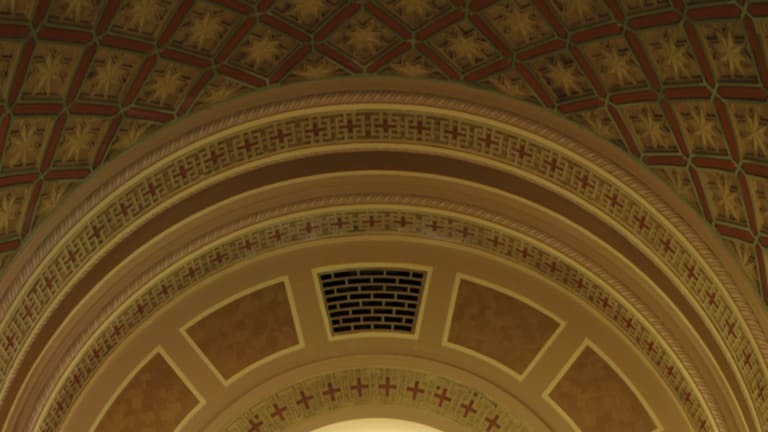 In the fifth floor small chapel, the polychrome ceiling was restored to its original condition, decorative metallic finishes were applied to wall panels and the ornamental medallions were gilded and antiqued. All about decorative ornamenting in commercial buildings.